In Exodus 25:10, God commands Moses to build the Ark of the Covenant, in which to hold His Covenant with the Israelites, the Ten Commandments, saying, “Have them make a chest of acacia wood- two and a half cubits long, a cubit and a half wide, and a cubit and a half high.” The ratio of 2.5 to 1.5 is 1.666…, which is as close to phi (1.618 …) as you can come with such simple numbers and is certainly not visibly different to the eye. 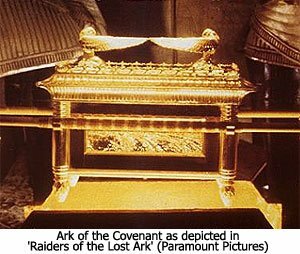 The Ark of the Covenant is thus constructed using the Golden Section, or Divine Proportion. This ratio is also the same as 5 to 3, numbers from the Fibonacci series. Note: A cubit is the measure of the forearm below the elbow. In Genesis 6:15, God commands Noah to build an ark saying, “And this is the fashion which thou shalt make it of: The length of the ark shall be three hundred cubits, the breadth of it fifty cubits, and the height of it thirty cubits.” Thus the end of the ark, at 50 by 30 cubits, is also in the ratio of 5 to 3, or 1.666…, again a close approximation of phi not visibly different to the naked eye. Noah’s ark was built in the same proportion as ten arks of the covenant placed side by side.